A new DNC ad accuses the GOP of playing politics with troop funding. (CNN) - For years, Democrats who voted against President Bush's defense budgets had to contend with Republican ads that accused them of failing to support the troops. Now the Democratic National Committee is releasing a new ad hurling the same politically toxic charge at the GOP. "How far are Republicans willing to go to protect the insurance industry and block health reform?" asks the narrator in the 30-second spot. "Far enough to deny funding and equipment for our troops in harm's way. "Republicans are so desperate to block health reform and protect their special interest friends that they delayed funding for our men and women in uniform. Then they voted against it. Tell Republicans to stop playing politics with health care. And to stop playing politics with our troops." An effort by Senate Republicans to filibuster the defense appropriations bill to stall action on President Obama's health care plan failed Friday, when three GOP senators - Susan Collins and Olympia Snowe of Maine, and Kay Bailey Hutchison of Texas - voted with Democrats to end debate and vote on the measure. The Democratic Senatorial Campaign Committee immediately slammed Chuck Grassley, David Vitter and Richard Burr – all senators up for re-election in 2010 – over the vote, accusing the lawmaker of "put(ting) partisan politics above funding our troops…"
The new ad will run on cable nationally and in Washington, D.C. starting Monday. Update: National Republican Senatorial Committee spokesman Brian Walsh said the ad showed Democrats were "desperate to shift attention away from the higher taxes and cuts to Medicare which fund their politically toxic health care bill." The Republicans didn't answer the question: why did they oppose giving our troops the equipment, weapons and body armor they need to defend themselves and the country? Why did Republicans oppose better health care and benefits for our veterans? Why do Republicans hate the troops? It's 1994 all over again with just an additional difference to the already obvious one: the Republicans are right this time around. The President is failing. We are losing the respect of other countries, as most recently evidenced by the treatments of the Chinese to the US press delegation in the joint conference by the leaders of both countries. For God's sake, wasn't Obama in the other side of the door? Outrage!! He's playing President of the World while the U.S. immerses itself into economic chaos and political deadlock. I think we need to start demanding more from the government we elected. We are still waiting for many promises. It is time to wake up, it's up to us now. Next thing you know, these desperately loony Dems will be blaming Republicans for wanting to stop them from cutting taxes. Dean, Pelosi, Franken, Frank, Reid, Shumer, Boxer, Waxman, Messiah – what a hilarious circus! I think its been obvious to most that the Republicans are serious about destroying president Obama's presidency, but I never thought they could stoop this low. They are a disgrace. Its about time the DNC took it to the Republican Party in regards how they pushed America's soldiers into two battle zones without adequate equipment, including ZERO MRAP vehicles, knowing full well that the Taliban had been trained by the CIA to use IED's to destroy Russian convoys in Afghanistan. The DNC should also mention the Republican lawmakers gutted Veterans medical and mental health services PRIOR to their Iraqi War deployment knowing full well that extensive rehab and mental services would be critically needed. It was the Democratic lawmakers that gave the recent increases to the GI Bill which had previously been repeatedly blocked and stone-walled by the Republican lawmakers. The DNC ad's should mention those facts as well. Good for the DNC. The GOP is as unpatriotic as any of the accusations they make. The only thing they've done in the name of national security is spend us into a hole, reduce our prestige in the world, and create enough fodder and propaganda for extremists to recruit the next generation of terrorists. In other words, they do more harm than good. It should be no surprise because they don't care about our nation, only to be in power. This is just one of many examples to show it. Bit by bit, conservatives, real conservatives, see the GOP for what they are, and recent elections show it. It'll be fun to watch them squirm come back with hollow, meaningless responses. Good for them!!! Fair is fair. Remeber when the warmongering republicans said the dems were harming our gi's in Bush's needless Iraqi fiasco. 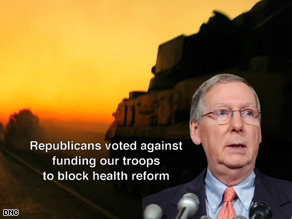 The party of treason has the nerve to comment about blocking funds for our troops? After they did everything in their power to enable a terrorist victory in Iraq! The National Socialist Democrat Workers Party has no shame. What further evidence is needed to illustrate that the GOP is the American Taliban? Bring home the troops to fight the evil tyrant Repaublicans here on our soil, instead of over there. The enemy is here, America, defend yourselves. I am not a real big fan of republicans, but this is the reason I absolutely hate democrats! you guys shoulda saved your money on this ad, we ALL know who hates the military, we all know who hates wars, whether they are necessary or not! you guys have no shame! anybody who responds to this and agrees with this ad is an idiot and would be one of those sheep that you can't even talk too!